Broncolor release a new radio system, two new packs and a head. 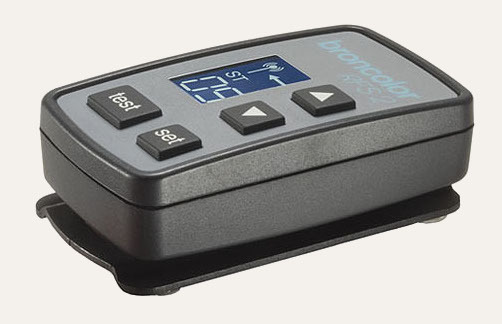 Elinchrom show two new portable heads and Gossen release an Elinchrom-compatible light meter. First we saw what the German manufacturers have brought to the market, and now here is a selection of what the Swiss have to offer at Photokina in Cologne this year. Broncolor are a highly-regarded Swiss manufacturer of professional lighting equipment. They tend to cater to the top-end of the market, with prices to match. You may find them at booth A-010, Hall 9.1 at Photokina. Integrated into the latest Broncolor lights (Senso and Minicom RFS), RFS 2 allows photographers to trigger lights while controlling their power settings from the camera. There are 99 groups and 40 channels with a claimed range of up to 200 metres. One can also buy an RFS Receiver (running on a USB power supply) for basic triggering of older and third party flashes. A 1200J monolight, the Minicom can be adjusted 5 stops in 1/10 stop increments. It has a 650W modelling light and can be remotely controlled via Broncolor’s RFS system. It is slated to be available for sale next month. 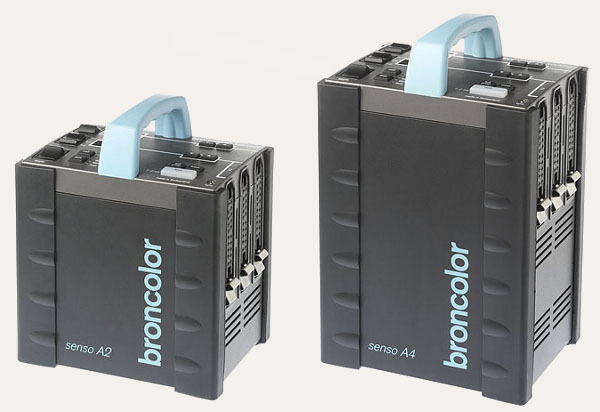 The Broncolor Senso A2 1200J and A4 2400J power packs (shown below) are designed to offer “genuine studio performance for the price of a compact system”. On both models there are three lamp outlets, a 6.5 stop power range (in 1/10 stop increments) and a choice of symmetric or asymmetric output distribution. The recycle time from full power is 2.8s on the A4 and 1.5s on the A2 with t0.1 flash durations of 1/90 s and 1/180 s respectively. Combined in kits with the Senso packs is the compact Litos flash head. Another Swiss manufacturer, Elinchrom will be at stands B-021 to B-029 in Hall 9.1 during Photokina. The Eco Ring Flash is meant to be used with the portable Ranger Quadra pack. Apparently it will be available in the UK from The Flash Centre for around £300. Picture here. This flash head goes with the Elinchrom Ranger RX battery pack. It has an LED modelling lamp and a flash tube which can be moved in and out of the reflector to focus the light. Picture here and video here. Another point is that is is styled in black while the original Ranger packs and heads are white. Maybe there is an updated Ranger on the way? Not really by Elinchrom but for Elinchrom, the Gossen DigiSky is a light meter that allows wireless control of Elinchrom RX lights. Thanks to everyone who submitted these tips!